That's great. The desire and right attitude are an excellent start, and exactly what we're looking for! However, it takes the right person with the right experience to make the team. Take a look at the requirements below. If you think you have what it takes to be part of a customer-focused, interactive team of performers contact us to set up an interview today. 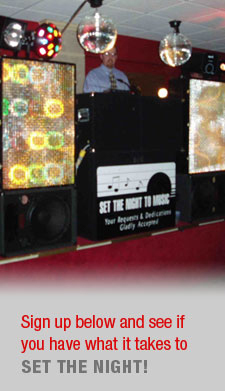 • Have prior Disc Jockey, Master of Ceremonies or entertainment experience. • Be outgoing, fun and able to lead interactive activities. Set The Night DJs ARE NOT BOOMBOXES. • Understand how to provide high-quality customer service both before and on the day of an event. • Be familiar with a variety of genres of music including big band and nostalgia, 50s & 60s, disco, 80s dance, country and today's current hits. • Have superior communications skills. • Be able to commit to availability 8 months to a year in advance. • Be willing to commit to training to understand Set The Night client expectations. • Be available for Friday and/or Saturday events. Optional availability for weekday and Sunday events. • Be able to transport sound and light equipment safely. Excellent compensation will vary based on experience and if you can provide your own music library or equipment. Interested performers please click the link below and fill out the following form. Qualified candidates will be contacted for an initial phone interview. Join the team of elite performers today! ©1996-2008 Set The Night To Music, All Rights Reserved.